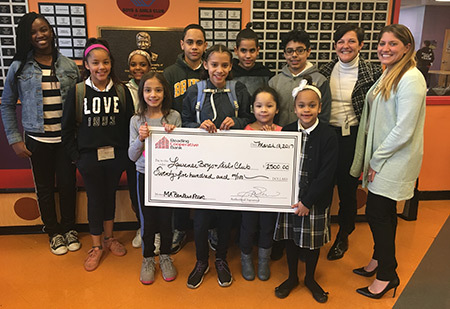 Reading, MA - Reading Cooperative Bank recently secured a $2500.00 grant from the Massachusetts Bankers Association for the Boys & Girls Club of Lawrence. The boys & girls club is an integral part of the Lawrence community and helps to support the residents. 96% of teen members from the club graduate high school and go on to college. The club hosts over 500 kids each day. In addition to being a safe place for kids to hang out and get school work done, the club also provides dinner to the kids. “The Boys & Girls Club of Lawrence is a wonderful organization that gives back to the community in so many ways. I am happy that we can help enrich their program offerings with this grant, and I look forward to continuing our partnership with the club,” says Julieann Thurlow, President & CEO of Reading Cooperative Bank. “The financial and volunteer support that Reading Cooperative Bank has provided to the Boys & Girls Club of Lawrence is helping to change over 4,400 lives. Our partnership has grown over the last year and we are so fortunate to be able to work with such amazing employees.” Says Andrea Nahigian, Director of Development.